When you follow the trend, you want to know when price breaks—and you want to know as quickly as possible so you can adjust your strategy. Trend Line Alerts is here to help. 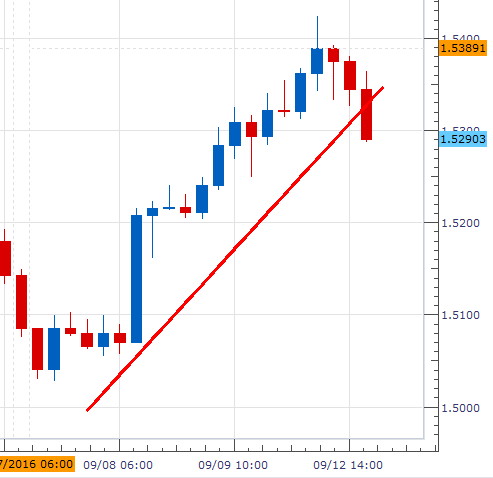 Trend Line Alerts is an indicator that allows you to draw trend lines that trigger alerts if broken. You can set alerts based on Intrabar or Close-of-Bar price breaks with additional customization options for line color, width and style. Alert lines can be quickly created or removed with a series of right-clicks within the Marketscope chart window. Want more than one trend alert? Simply run the indicator multiple times. IntraBar: Yes, to be alerted the exact tick the trend line crossed. No, to be alerted when the candle close price crosses the trend line. Line ID: Use different Line ID if you want to run multiple instances on the same Instrument. For example, if you wanted to set two trend lines on a single chart, you could set Line ID to “Top Line” for the first line and set the Line ID to “Bottom Line” for the second line. This indicator is only compatible with FXCM’s Trading Station Desktop. Additionally, an FXCM account is required (including free demo accounts).